Film Review: Beyond The Poseidon Adventure – I Love Disaster Movies! Sequels have a hard time. 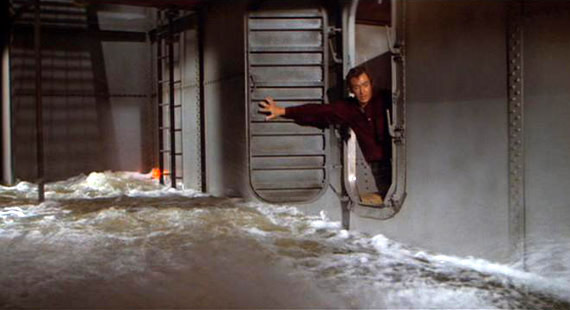 Imagine having to follow-up a film that kick started a whole new genre – The Poseidon Adventure had paved (or sunk) the way for the disaster movie and Irwin Allen had made his mark. “Beyond The Poseidon Adventure” is very much an homage to the original and while it’s not nearly achieving the great heights its predecessor did, it’s not an awful film and is quite fun when taken lightly. After seeing a rescue copter carrying the survivors of the original movie flying to dry land, a motley crew containing Michael Caine and Sally Field decide to look for salvage to save themselves from certain bankruptcy. When they arrive at the wreckage, a rival group is waiting to meet them but instead of coming for salvage, they are coming for black market goods. Along the way they are joined by various other survivors still trapped inside. When the rival salvage groups decide to go their separate ways, war ensues and only one side will survive – if the ship doesn’t sink first! A sinking ship and a lot of people who can’t shoot guns properly! The plot is ludicrous with trapped survivors being “in on the deal”. The acting is generally in the over-the-top campy drama category and the nitpicks are so abound you could watch the film again to count them. However there is a certain spirit to the film that everyone knew it was all a bit dodgy and are enjoying themselves and just taking the film for what it is – silly harmless fun. The main wave scene from the original is reused, as are several pieces of set footage too. The sets themselves look in-keeping with the original and there are some good set piece effects such as the rushing water scene and the steel beam crashing through several floors but apart from that very little in the way of effects takes place. “Beyond The Poseidon Adventure” reportedly had a bigger budget than the original but its hard to see that any of it was spent on sets, scripts (the novel it’s based on is far-fetched enough – tigers anybody?!) or stunt crew. It appeared to have been spent on getting some big names in. The climax just shows how poor the effects are when you compare it to the originals big wave scene. It has that awful early computer effects explosion that is clearly drawn/super imposed onto the screen and has aged so, SO terribly. The film ends with a whimper because of it but you’ll be so in awe of its awfulness, you’ll want to replay it again and again. There are lots of silly things that make this disaster movie a must see for a lot of the wrong reasons. Nitpicking is good fun, as is Slim Pickins’ drunken character for all the wrong reasons. How on earth did they expect that to be taken seriously?! The inclusion of a blind character was actually quite genius in a way and the fact that the ship’s nurse in-between the films has completely changed body, voice and shape just adds to the humour. Also quite how Fields and Caine actually develop a love interest when he calls her “Monkey” throughout the film is beyond me, although Sally’s character is adorably annoying. Monkey. It has to be monkey. An unknown henchman gets an Axe to the chest! All we see though is the axe welder screaming loudly! Sally Fields wins hands down for me, although a drunk-throughout-the-film Slim Pickens comes in a close second. Apparently the VHS and DVD release shave 8 minutes off the film that flesh out some of the characters to keep the action flowing thicker and faster. In what was one of the last of Allen’s bigger productions, I find that Hollywood’s not learnt its lesson when Wolfgang Peterson left his studio when they chopped 20 minutes off Poseidon for the same reason. Both films sited as having a lack of character development. Perhaps this review has not shown the film in its best colours. “Beyond the Poseidon Adventure” is one of those films where its all done clumsily that it makes for compulsive viewing. It definitely falls in the so-bad-its-good category but that would also play down all the hard work that obviously went into it. The DVD does have a making of which we will upload once our YouTube Channel is under way but until then, grab the film if you can and prepare for an unintentional comedy classic.